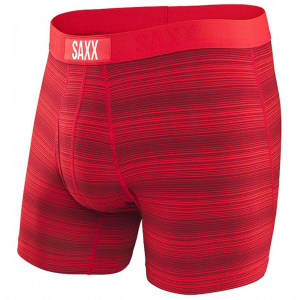 Built for high-output activities, the Saxx Kinetic boxer briefs with an 8 in. inseam deliver moisture-wicking and quick-drying performance with an all-around supportive fit. Built for high-output activities, the Saxx Kinetic boxer briefs with a 5 in. inseam deliver moisture-wicking and quick-drying performance with an all-around supportive fit. Built for on-the-go travelers on epic adventures, the Saxx Quest 2.0 boxer briefs are made from ultralight, quick-drying, mesh fabric with antimicrobial anti-odor performance. Built for travel and epic adventures, the Saxx Quest 2.0 boxer briefs are made from ultralight, quick-drying, pin-dot mesh fabric with an anti-fold waistband, ideal for on-the-go wash and wear. For all-day, everyday comfort and performance, the Saxx Vibe Boxer Briefs are made from soft, moisture-wicking fabrics with a slim, supportive fit for smooth, against-the-skin contact.